When a well-known person faces a serious medical situation, it brings attention to the illness and treatments. Brokaw, a member of the Mayo Clinic Board of Trustees, had been suffering from persistent back pain. His doctor visits close to home didn’t yield any answers, so he eventually made an appointment when he was in Rochester to see a Mayo orthopedist and then his internist. Brokaw’s case was particularly tricky as nothing was spotted during the initial exam. His internist, Dr. Andrew Majka, wanted to look a little deeper. He ordered blood tests because he was concerned Brokaw had a hematoma from two unexpected falls he’d had while fishing. After examining the blood results, Dr. Majka and Dr. Morie Gertz, chair of internal medicine, confirmed the diagnosis of multiple myeloma. “In my 30 years of work on multiple myeloma, I have seen a 200 to 300 percent improvement in survival rates. It used to be uniformly fatal,” says Gertz. “The future of patients who have been stricken with multiple myeloma is very, very positive. There are new drug trials that we are leading. There is rapid development of new diagnostic tools, brand new therapeutic classes of drugs and new biological agents. All of these can be combined to maximize outcomes and minimize any adverse effects and allow patients to lead a completely normal life,” says Gertz. He says multiple myeloma will continue to be heavily researched, and Mayo will be an important partner in new treatments based on the understanding of the biology of the disease. 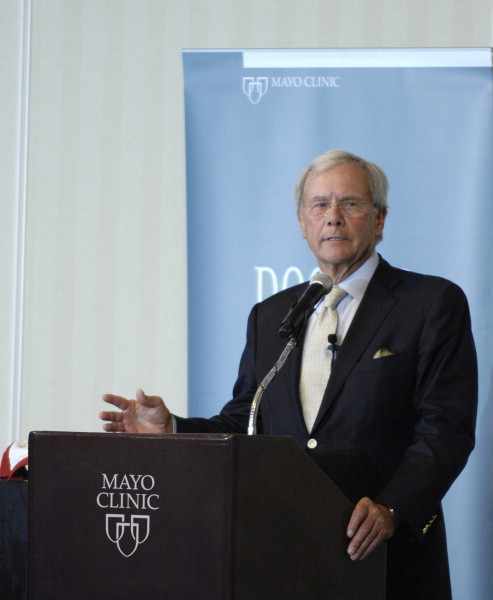 Brokaw writes that even before he became a Mayo trustee, he shared a “Midwestern pride” in the clinic as “one of the world’s greatest healthcare facilities, known for its expert, coordinated care and patient efficiency. Watch a video of Morie Gertz, M.D., describe how Mayo Clinic is advancing diagnosis and treatment of multiple myeloma.